Cooper Pallasch (left) and Steven Kinney stand in front of one of the Cessna 150s used in competition during SAFECON 2018. They finished as the top two pilots in the nation, respectively. 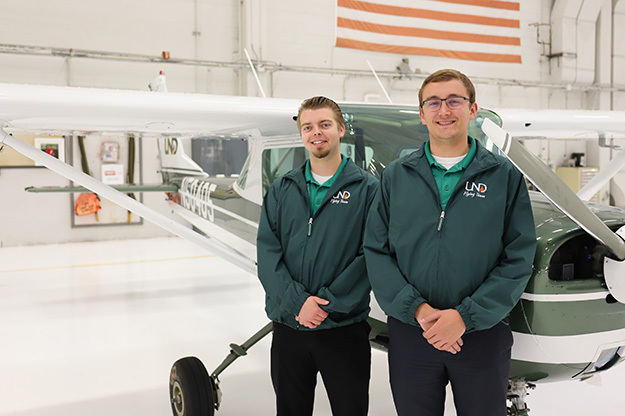 The pair of senior co-captains have built years of experience through pursuing their aviation degrees as well as participating in the UND Flying Team. Photo by Connor Murphy/UND Today. When Cooper Pallasch and Steven Kinney led the UND Flying Team to national competition, the co-captains were hoping for the best. 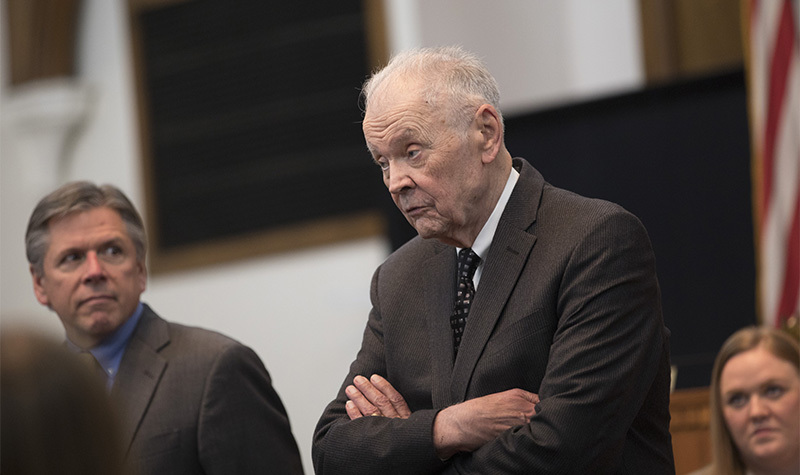 After last year, they lost years of experience in departing seniors. Kinney says there were doubts among the team, and many were worried about how things would go. At SAFECON 2018, UND maintained its reputation as Pallasch and Kinney secured the top two individual spots, respectively, and aided a second-place finish out of 30 competing institutions. The team has now finished first or second in 29 of the past 35 years. The UND Flying Team sent 14 of their 22 members (above) to SAFECON 2018. Co-captains Cooper Pallasch and Steven Kinney have been with the team since their freshman year, four years ago. They encouraged all aspiring pilots coming to UND to consider joining. Image courtesy of UND Flying Team. 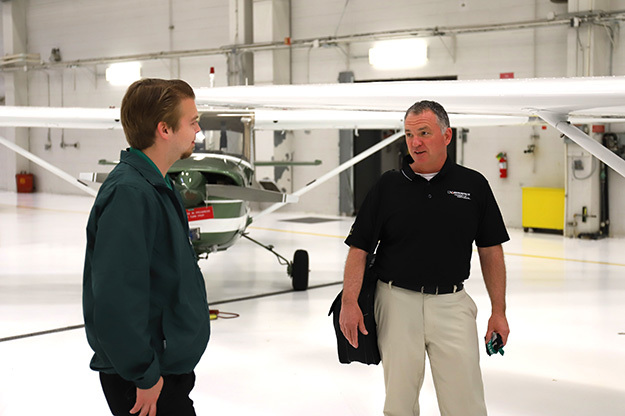 SAFECON, a yearly convention and competition by the National Intercollegiate Flying Association (NIFA), brings aviation schools together to test the mettle of their top students. This year, the competition was hosted by Indiana State University near Terre Haute, Ind. Pallasch, who earned the distinction of Top Pilot in the nation, says their crew shouldn’t be confused with the flashier UND Aerobatic Team. While aerobatic pilots are strictly judged on their airborne performance, the UND Flying Team faces a comprehensive set of challenges. SAFECON consists of 11 events spread over a week. They range from a complex math test using a slide ruler (called Computer Accuracy) to landing a Cessna 150 as close to a target line as possible after a short flight. 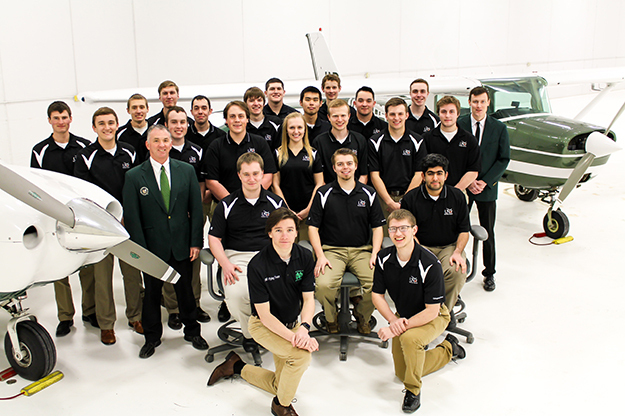 Fourteen UND Flying Team members went to Indiana for the competition. Kinney, who recently graduated, took first place in the Short Field Landings event. Pallasch didn’t grab a first place, but placed second in four of his seven events — giving him the points to be number one, overall. 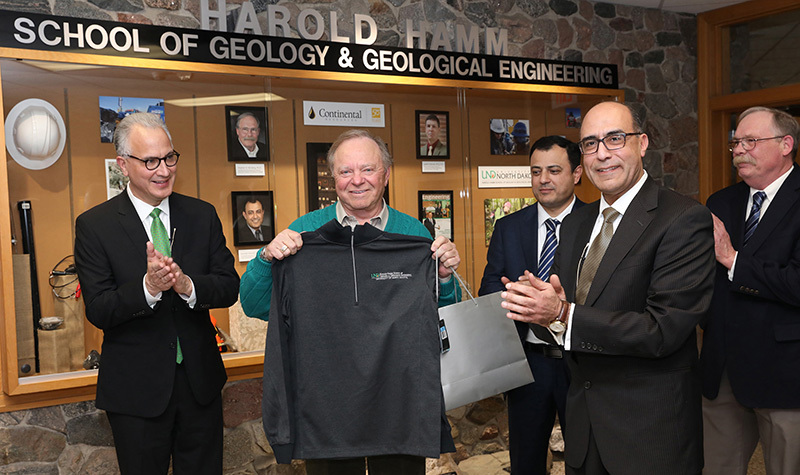 Lewis Liang (right), professor of aviation and UND Flying Team coach, develops top-tier talent by letting students shine on their own and advising when necessary. With years of coaching and teaching experience, Liang knows the UND Flying Team provides a unique learning opportunity. 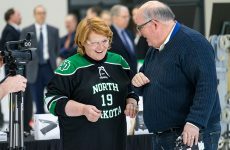 Photo by Connor Murphy/UND Today. Lewis Liang, an associate professor with UND Aerospace, has coached the UND Flying Team for the past ten years. In developing understudies like Pallasch and Kinney to be top-tier co-captains, he focuses on developing their leadership skills and letting them shine with measured oversight. When asked what brings the convention aspect to SAFECON, Liang pointed to the facetime students get with industry representatives and figures in the aviation community. Companies set up booths for recruitment and the host college typically gains sponsors for social events. Liang says that part of his responsibility as a coach is to push them for more than their abilities around the airstrip, but excellence in all areas of their lives. He wants to bring team members to the national stage who stand out from the crowd for their hospitable qualities, and it’s something that shows. Pallasch, along with Kinney, joined the team four years ago as a freshman. He says it’s a commitment, but it’s worth at least showing up to an organizational meeting. “If you’re on the fence, go to Odegard 356 on a Monday or Wednesday night, you’ll find us there,” he said.